Do The Math - Blog by the Ethan Iverson, pianist from The Bad Plus. Riffitides - Excellent jazz blog written by a journalist and published writer. Greenleaf Music Blog - Blog for Dave Douglas' record label, Greenleaf Music. Darcy James Argue's Secret Society - Blog written by a member of a Secret Society, a New York-based big band. Covers a lot of interesting topics including, of course, jazz. Joe Alterman's Blog - A talented young jazz pianist from Atlanta shares his experiences while studying jazz at NYU. Blog-O-Jazz - A sharing of jazz experiences through concert photos and autographs, plus a few random thoughts. Casa Valdez Jazz - Jazz blog containing saxophone info, jazz resources, musician features, harmony and improvisation lessons, and more. The Jazz Cat - Jazz blog site with several articles, photos, interviews, and even some video clips! Nicholas Payton Blog - Sometimes controversial but usually interesting blog from one of the best trumpet players around today. Ian Carey Jazz - Musical announcements and thoughts from a Bay Area trumpeter and composer. JazzBrew.com - A great trumpet blog that follows the journey of an aspiring jazz trumpeter who started playing in 2000.
International Trumpet Guild Journals - Although it isn't a personal trumpet blog site, the ITG journal page is a nice collection of articles encompasing many facets of trumpet playing. All About Jazz - Good variety of jazz topics. TrumpetHerald.com - Wide range of trumpet forums, including several forums dedicated to specific trumpet methods. TrumpetMaster.com - Wide range of trumpet forums, including an artist in residence section featuring jazz trumpeter Ingrid Jensen and other professional trumpet players. LearnJazzStandards.com - Play along videos, charts, and video links to famous recordings of professional musicians playing each jazz standards. Library Of Congress - Photographs from the Golden Age of Jazz. All About Jazz - Articles, album reviews, jazz exhibits, and more. Jazz.com - Jazz blog, articles, album reviews, jazz exhibits, and more. Birka Jazz Archive - An amazing and beautiful collection of classic jazz album covers. Jazz In America - Jazz history and education resource from the Thelonious Monk Institute. A Great Day In Harlem - A site dedicated to one of the most famous jazz photographs. petethomas.co.uk - Tutorials covering jazz theory, arranging, improvisation, and composition. A Jazz Improvisation Primer - Information on many topics relating to jazz improvisation, from jazz history to music theory to practical advice on playing in a group. JazzQuotations.com - Large collection of quotations from famous jazz musicians. Music Theory Online - An incredibly thorough source for music theory information. TheJazzSession.com - Excellent resource for interviews with today's prominent jazz musicians. JazzEveryone.com - Jazz educator, Willie Thomas, shares several free jazz instructional videos. Tranumentary - Dozens of audio interviews by top jazz musicians discussing John Coltrane. In many cases, the interviewee is a jazz musician who actually knew John Coltrane! 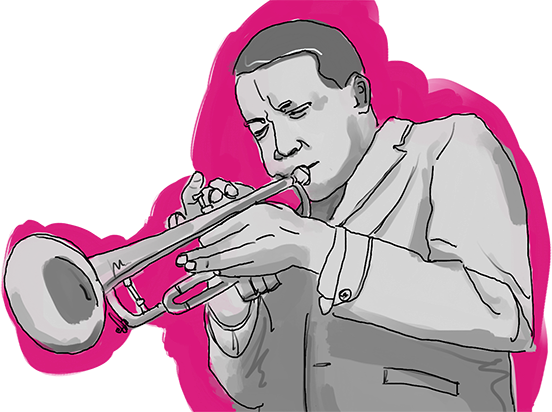 The Red Hot Jazz Archive - A online history of jazz before 1930, with dozens (maybe hundreds!) of audio clips. NPR Jazz Record Library - Clips with commentary for about 100 must-have jazz recordings. Be sure to visit their archive of Marian McPartland Piano Jazz recordings. JazzPracticeLoops.com - A good resource for play-along tracks, especially if you don't have many Aebersold recordings, or if you're looking for a change of pace. Also has some good theory information. Bob Keller's Jazz Page - Loads of categorized jazz links. This page will definitely keep you busy! JazzyMusic.com - Several jazz site links, including a good collection of jazz history sites. Aebersold.com.com - Storefront for Aebersold play-a-longs and tons of other jazz books. TheMusicResource.com - Large catalog of jazz CDs, run by Aebersold. eJazzLines.com - Jazz mega-store with CDs, videos, posters, books, and sheet music. RandyHunterJazz.com - Atlanta-based jazz educator and author of several jazz etude and method books.